The new range of Pure Cinnamon products from Sundara Botanical is now being launched now at the Auckland Food Show, located at the ASB Showgrounds from the 27th to 30th of July. Cinnamon is one of the world’s most popular spices. Pure Cinnamon is genuine Cinnamon harvested from the original Cinnamomum Zeylanicum Blume tree variety of Sri Lanka or as it was formerly known, Ceylon. The Cinnamon from these trees has been sought after for its flavour, fragrance and health giving properties for over 3000 years. Arab Traders jealously guarded their source of this amazing spice for millennia. Pure Cinnamon is much lower in the toxin courmarin than its near relative, the Cassia tree. Cinnamon from the original Cinnamon trees of Sri Lanka carries less than 0.02% of this substance. Cinnamon extracted from Cassia bark has a much higher 4-8% of courmarin. Always ask for and select Pure Cinnamon, the original and the best. Use it on your coffee, your Chai Tea, your buns and cookies, in your curries and when serving meats. Pure Cinnamon – The gift from antiquity, the spice of life. 350mg. Processed in New Zealand. Highest efficacy and oil content, due to cold climate processing. Contains 90 Capsules. Ceylon Cinnamon only – No Cassia. ‘Cinnamomum Verum’. 50g. Ground and processed from Pure Ceylon Cinnamon bark in New Zealand using cold climate processing to ensure higher oil content and efficacy. Promotes sugar metabolism, Heart and Circulation. 50ml spray bottle ready to use. Extract of Cinnamomum Verum. Fresh and Vibrant. Real Ceylon Cinnamon Extract. 350mg. Bioactivated Turmeric. High Strength. Bio-Available Certified Organic Turmeric with MCT from Coconut Oil and Black Pepper. Each capsule contains the equivalent of 4000mg of Turmeric. Manufactured under the code of GMP. 60 Vege Caps per container. Concentrated and Bio-Available with Cinnamon, Ginger, and Black Pepper. Manufactured in Australia under the code of GMP. Each Container contains 300ml. These products and more will soon also be available for purchase from our website. Cinnamon is a spice that comes from the branches of wild trees that belong to the genus “Cinnamomum” – native to the Caribbean, South America, and Southeast Asia. (Cinnamomum aromaticum), which originates from southern China, is typically less expensive than Ceylon cinnamon. Due to the fact that Ceylon cinnamon is more expensive, most foods in the USA and Western Europe, including sticky buns, breads and other products use the cheaper Cassia cinnamon (dried Cassia bark). These days cinnamon is regarded as the second most popular spice, next to black pepper, in the United States and Europe. Modern research indicates that cinnamon may have some beneficial health properties. Having said that, it is important to recognise that more research and evidence is needed before we can say conclusively that cinnamon has these health benefits. According to the U.S. National Library of Medicine, Cinnamon can be used to help treat muscle spasms, vomiting, diarrhea, infections, the common cold, loss of appetite, and erectile dysfunction (ED). According to the National Institutes of Health, cinnamaldehyde – a chemical found in both types of cinnamon – could help fight against bacterial and fungal infections. Cinnamon may help improve glucose and lipids levels in patients with type 2 diabetes, according to a study published in Diabetics Care. Tel Aviv University researchers discovered that cinnamon may help prevent Alzheimer’s disease. According to Prof. Michael Ovadia, of the Department of Zoology at Tel Aviv University, an extract found in cinnamon bark, called CEppt, contains properties that can inhibit the development of the disease. Cinnamon may help stop the destructive process of multiple sclerosis (MS), according to a neurological scientist at Rush University Medical Center. 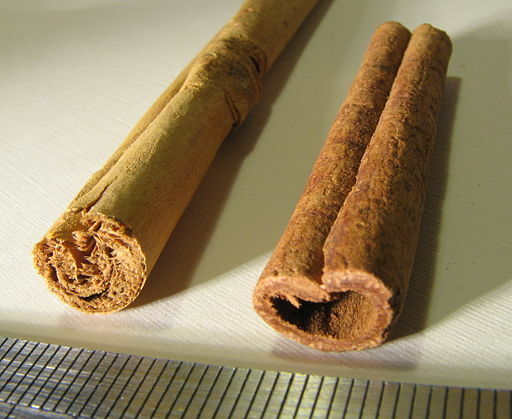 Cinnamon could help eliminate the need to take some expensive and unpleasant drugs. Penn State researchers revealed that diets rich in cinnamon can help reduce the body’s negative responses to eating high-fat meals. Research published in the journal ACS Nano suggests that scientists have found a way to package antimicrobial compounds from peppermint and cinnamon in tiny capsules that can both kill biofilms and actively promote healing. In this video, Dr. Josh Axe discusses the possible health benefits of cinnamon. On the next page we look at the nutritional profile of cinnamon and the health risks associated with consuming it (including the fact that cassia cinnamon in particular contains coumarin). We also discuss Tolerable Daily Intakes and how much cinnamon you can safely eat each day. Some people who are sensitive to cinnamon may be at an increased risk of liver damage after consuming cinnamon-flavored foods, drinks and food supplements. This is likely due to the fact that cinnamon contains coumarin, a naturally occurring flavoring substance, which has been linked to liver damage. Cassia cinnamon powder (commonly used in foods in the USA and Western Europe) contains more coumarin than Ceylon cinnamon powder. A 2010 German study found that on average, Cassia cinnamon powder had up to 63 times more coumarin compared to Ceylon cinnamon powder, while Cassia cinnamon sticks contained 18 times more coumarin than Ceylon cinnamon sticks. A study carried out in Norway and published in the journal Food and Chemical Toxicology in 2012 suggested establishing a Tolerable Daily Intake (TDI) for coumarin of 0.07mg per kg of bodyweight per day. The researchers commented that by sprinkling cinnamon on oatmeal porridge or drinking cinnamon-based tea regularly, adults and children can very easily exceed this amount. Based upon the conclusion of this study, if the average weight of an American male is 191 pounds (86.6kg), it could mean a maximum Tolerable Daily Intake of 6mg of coumarin. For an average American female (159 pounds or 72.1kg) it could mean a maximum of 5mg of coumarin per day. In a document published in 2006, the German Federal Institute for Risk Assessment (BFR) suggested that 1kg of (cassia) cinnamon powder contains between 2.1 and 4.4g of coumarin. If you estimate that powdered cassia cinnamon weighs approximately 0.56 g/cm3, a kilo of cassia cinnamon powder would equal 362.29 teaspoons. This suggests that a single teaspoon of cassia cinnamon powder could contain between 5.8 and 12.1mg of coumarin (which may be above the Tolerable Daily Intake for a smaller individual). Sensitive people who consume cinnamon-flavored foods, drinks and food supplements may have a higher risk of liver damage, researchers from the University of Mississippi, USA, and King Saud University, Riyadh, Saudi Arabia, report in the Journal of Agriculture and Food Chemistry. Cinnamon is one of the most important flavoring agents in foods and drinks, team leader Ikhlas Khan explained. It is the second most popular spice, next to black pepper, in the United States and Europe. Ceylon cinnamon, also known as “true cinnamon” (cinnamon verum) is very expensive. Therefore, most foods in the USA and Western Europe, including sticky buns, breads and other products use the cheaper Cassia cinnamon (dried Cassia bark). Cinnamon comes from the bark of trees and is sold as sticks or powder in the country of origin. Ceylon cinnamon grows in Sri Lanka, Madagascar and the Seychelles, while Cassia cinnamon comes from Indonesia and China. Previous studies have linked coumarin intake to liver damage in a small number of sensitive individuals. True cinnamon has very little coumarin, unlike Cassia cinnamon. A 2010 German study found that on average, Cassia cinnamon powder had up to 63 times more coumarin compared to Ceylon cinnamon powder, while Cassia cinnamon sticks contained 18 times more than Ceylon cinnamon sticks. The researchers in this latest study also reported that coumarin, a naturally-occurring substance, may cause liver damage in some sensitive people. According to health officials, consumers cannot tell the difference between Ceylon and Cassia cinnamon in powder form. Cinnamon sticks look different though – Cassia cinnamon sticks consist of a thick layer of rolled bark, while Ceylon cinnamon sticks have thin layers.